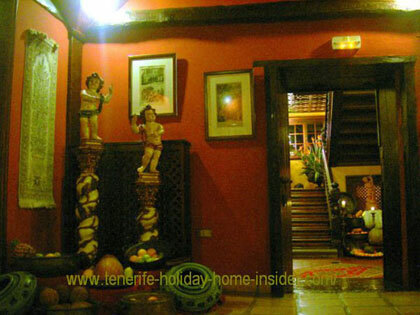 Tenerife holiday review Villa Abaco for going out with culture. Tenerife holiday review for Abaco cultural nightlife in the north. A Tenerife holiday review of the Abaco of Puerto de la Cruz was never planned. It was always 'out of the blue' when I went to this former historic Orotava country estate. The best of holidays are like that. Tenerife holiday review on a wall at Casa Grande Abaco. 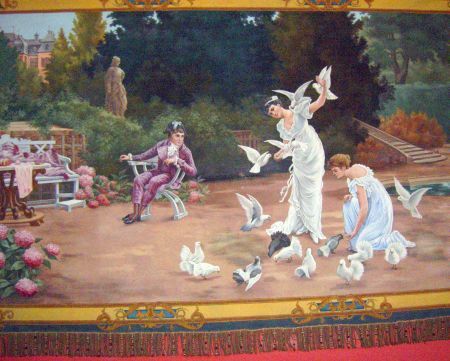 Just like the country bliss in the photo of the Gobelin wall hanging above. That too, represents a holiday review, but of times of yore. It was a romantic evening in 2003 which was like in a fairy tale. A Spanish friend said he wanted to show me his special "club" to round off an evening of a day which he called memorable. This place is so exclusive in all kinds of ways but, everybody is welcome. 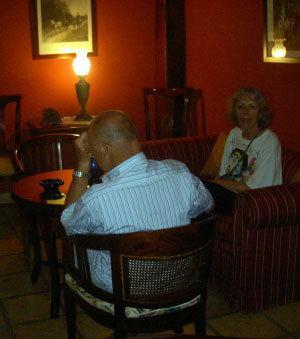 Tenerife holiday review about Abaco midnight romance. Illumination was dimmed at night in the main salon upstairs when I was there for the first time. At one stage, somebody asked for the famous Yesterday song by the Beatles. It added to the overall mellow mood. What else is special about this so called' Casa Grande Abaco' (Big house Abaco) that merits a holiday review any time of the year? The Abaco is an icon of Tenerife culture of past as well as of present days. It's also a Casa Museo a house turned museum. 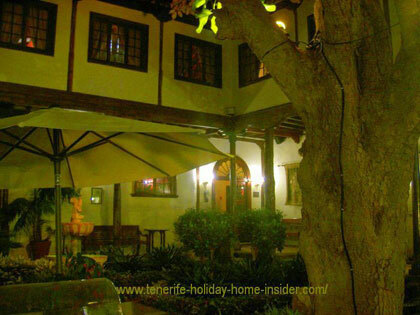 It gives you a glimpse of a XVIII-th century life style of a most fortunate Tenerife society. Abaco rustic decor farm bounty a part of its interior decoration museum display. History of Abaco Mansión in a few words. This former Finca or Hacienda (farmstead) and private country estate called Abaco Mansión in Spanish belonged almost always to Tenerife or Canary Island aristocrats. In fact, its roots go back to the conqueror of Tenerife. Even, the elusive Count of la Gomera owned it, at some stage. Only one person from Scotland surged in the listing of Abaco's more recent proprietors. He contributed to the bulk of restorations. Now, it has a local owner again. He is the one who brought music back to the mansion as well as shows. More about it in a link below of this Tenerife holiday review. Obviously, the Abaco is a first class example on how to coordinate the world of the mundane and that of the very practical and down to earth. A place for a date or a wedding anniversary? The space for many guests is there with inside and outside options. The landscaping of the Abaco garden allows with many nooks for much privacy. This makes it ideal for romantic and memorable events. A fairly large, sparsely lit semi patio (indoor yard) with wicker chairs invites to take a seat with a cocktail. Otherwise, you may walk around this oasis under palms and tall trees. Imagine yourself to smell flowering shrubs while gazing at stars. Small fountains create a water play in a large pond, while all is bathed in the soft light by few lanterns. Also spot all this from the staircase of a former barn which leads to the upper salon. Music on the Grand Piano is still on the agenda at Abaco from 11 p.m. until 2.20 a.m. on Saturdays, to the best of my knowledge. Abaco garden in its Patio interior yard. Explore the magnificent garden recluse surrounded by traditional Canarian buildings. Do it with or without a drink under moon light after an evening concert. This urban paradise with rural flair is unique by design and size on the entire Tenerife Island. Tenerife holiday review of Abaco classical music and opera arias. My third visit to the Durazno's special country estate was in December 2007. It was another unplanned holiday experience I am happy to talk about now. That's when I met the Trio Bohemio for the first time. They are still performing now in 2017 and 2018. Opera Arias belong to their highlights. Normally, you only hear those at the Auditorio Santa Cruz in the Tenerife capital. A young Spanish lady from Madrid called Amparo on the piano is still part of their team. The professional skill of the two Slavic singers who may be from Prague is amazing. They perform in French, Italian, German, Spanish as well as in Slavic languages. In 2007, approximately 30 guests were all seated in groups along the walls of the salon. They were mainly Spanish and German. My Tenerife holiday review must note the overwhelming applause they gave after this concert. The performance was by the Trio Bohemio. It has become very popular at the Abaco. The Bohemio group of three is still on the agenda more than once during each Abaco concert season. The biggest hit was the song "l'amour est un oiseau rebelle" when it was sung at the end of the concert in French. This particular Abaco event started after 9.30 p.m. after we had missed a previous one which ended shortly before. Entrance per person was €17, contrary to only €10, nowadays. Drinks were not included. Well worth the expense, nevertheless... By the way, if you find the cocktails expensive, order a beer instead. Go downstairs where a huge choice of drinks will spoil you in a cozy surrounding. Sample the mixed fruit juice called in Spanish Abaco sumo de fruta mixta. You see me here surrounded by soothing light in the Abaco salon downstairs in a picture which I received, later. However normally during concerts, Abaco management uses stronger illumination. Getting to the Casa Grande Museo Museum Abaco. It takes about two minutes to get there from the top of La Paz after the Cupola Commercial Center. Abaco staircase glimpsed from the ground floor from a group of baroque angels and other ornaments. There are very few spots like the elegant Abaco for going out at night in Tenerife North. Links to more information following this Tenerife holiday review. 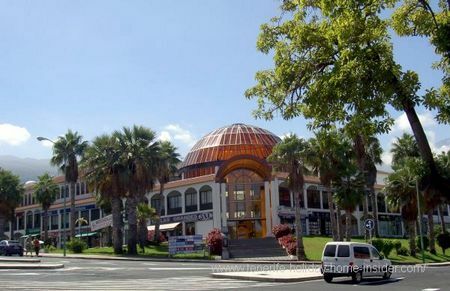 Alternative Realejos country estate with animals and restaurants. 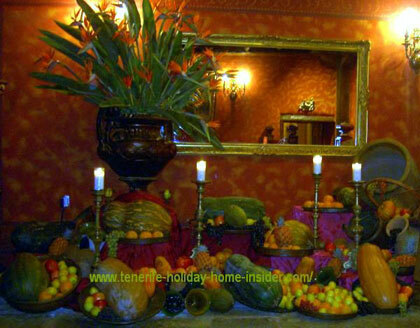 From Tenerife holiday review back to entertainment Tenerife much of which comes for free.